Claude Robert "Bob" Kehler, (born April 7, 1952) is a retired United States Air Force general who served as Commander, U.S. Strategic Command from January 28, 2011 to November 15, 2013. He previously served as Commander, Air Force Space Command from October 12, 2007 to January 5, 2011. 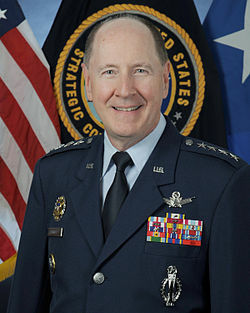 As commander of Air Force Space Command, he was responsible for the development, acquisition and operation of the Air Force's space and missile systems. He oversaw a global network of satellite command and control, communications, missile warning and launch facilities, and ensures the combat readiness of America's intercontinental ballistic missile force.